Their species diversity makes them the largest group in the spider kingdom. There are 5121 species and 560 genus marked in the world located all over the planet, which is almost 13% of all arachnids. In the Czech Republic we monitor 68 species in 46 genera. They inhabit diverse habitats on almost all continents. Their sizes are various too; we can find dwarf sized individuals that do not grow over 2mm in body size, but also truly big species that can be found in tropical areas, which frequently grow over 20-25mm. They often intensify their size by thick hair and very bright colouring. 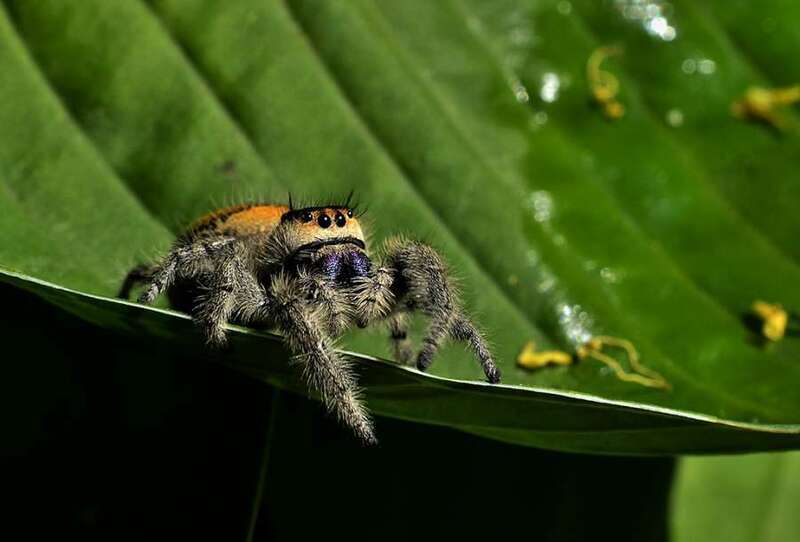 Among the largest species of the Phidippus, Hyllus or also the Plexippus, and Philaeus genus are included, with the Philaeus chysops specie, which is rarely found even in our territory. Not long ago managed to receive a few live specimen of the Phidippus genus together with the King Jumping spider (Phidippus regius) from South Carolina (USA). I will try to share some insights from observing these unique creatures. The jumping spider is named aptly in terms of size for the family. It is the largest species of the jumping spiders (Salticidae) from the subtropical zone of the American continent, which is amply represented in the southeaster part of the U.S., Mexico, the Small Isles and the Greater Antilles all the way to Costa Rica. Females grow up to 15 to 22 mm in body size, and limb span from 22 to 35mm. Grown males measure 12 to 22 mm on the average. Similarly as other spider species, the size can vary on the level of one population. I recorded a male 6mm long but also giants that had almost 20mm. Their chelicerae are widespread and brightly coloured at first glance but most often in a rainbow shade or a combination of green blue and purple. Green or magenta may also dominate. The first pair of legs, similarly as most other members of this family, are longer than the body its self. Both genders are easily distinguished from one another. Throughout the development it is evident at first sight that there is sexual dichromatism. From the first instar males are black with a white spotted pattern in contrast with white stripes on the first pair of limbs. On the abdomen a basal ornament is formed in the shape of a triangle composed out of two oval white spots, which stays throughout their whole lives. Likewise, even females can have the dorsal part of their body black. In some populations it may be combined with the coverage of white, irregular spots. The females’ primary base is indeed a wide range of colours, from grey, light brown, brown, orange, or even a combination of some of the colours named above. The whole genus is plentifully represented. To this day 60 species have been named and at least 20 more are waiting for review. Co-existence of related species in a geographic region: P. regius, P. audax, and P. otiosus. - Males – back marks on the abdomen are orange and the females’ are quadrangular. - Males marks on the abdomen are oval and are arranged into a triangle, famales’ marks are missing. - Males – spots on the abdomen are linear, the fourth pair is an matte black. The females have a matte black coloring from the ventral perspective. Like most other species of this family even the king jumping spiders are photophilic animals. That means that most life displays depend on the intensity and the length of day light including reproduction. Reducing the day light intensity the spiders’ activity reduces, they take shelter in their dwelling where they line a thick insulating layer and wait the rain season or winter in geographically colder areas out. Among individual populations local differences with diverse lifestyles occur. These may differ from one another significantly. For example populations coming from northern Florida have a lot more developed connection to interspecies and intraspecies tolerance than groups living the Caribbean islands. We believe that one of the reasons could be related to the amount of food available in all stages of development of the spider. In other words the variety of food and especially its abundance, as it seems, may be a lot more favorable on the continent than on islands, where there is a greater competition not only for food but also the sexual partner. For hunting and the search for potential mates they use their excellent sight. Phidippus regius is one of the few spiders that express their sexuality at such an early instar stage. Juvenile males and females often imitate sexual courtship in the third instar. Probably it’s their way of protecting themselves from being hunted and subsequently devoured by their older relatives, who are confused by their sexual suggestions and change the strategy of hunting. (Edwards, 1979). Successful copulation only occurs after reaching sexual maturity, which is around the sixth to eighth ecdysis. We often encounter an interesting phenomenon with the jumping spiders from the Phidippus genus. Grown males guarantee themselves successful copulation by searching for sub-adult females. They build a shelter in their immediate vicinity or share a household. Then they wait here for the female to fully mature (Edwards, 1979). While courting the males perform a species specific dance, in which they expose the front part of their limbs and of legs(Edwards, 1975). The chelicerae, thanks to their species diversity in geographical spreading, represent the first visual contact for the females. During his experiment in 1977 Jackson proved that the males of P. johnsoni stimulate the females to copulate with their tactile ritual with much greater success inside their nests than with visual courtship outside them. Similar tactile courtship has been noticed even in other species of the Phidippus genus - P. cardinalis and P. whittmani together with P. audax, P. clarus, and P. otiosus, which live together. Approximately two to three weeks after copulation the female produces thick silk cocoons, in which she lays 50 – 200 eggs. These spider-web sacks are often composed into all sorts of places, e.g. under the bark of trees, especially oak or pine trees, furthermore cracks and apertures in ancient buildings and stone walls. During their active life from March to September females lay up to four broods with the total of about 400 eggs. The maximum production counted during studies of the species was 715 (Edwards 1980). The number of eggs in each following brood progressively decreases. The jumping spiders build their own silk nests, which have an elliptic structure and have emergency exits on each side. They use these shelters not only to rest, where they hide after dusk, but they go through their exuvial stages and raise their offspring here as well. Besides building nests jumping spiders use spider-webs to hunt by attaching the web to their prey while jumping. The spider’s web slows down the fall in case it misses the target and abeles it to continue trying as soon as possible. This species prefers open, semiarid biotopes with mixed vegetation. They give priority to flat vertical surfaces, that guarantee better maneuvering while hunting prey or during courtship. The young are usually found in the lower levels of palm trees, bushes, or even grassy areas. Older individuals especially grown ones prefer higher levels e.g. palm trees or other tall trees. In places absenting vegetation like the forest-steppe or urban countries they may use monoplanary surfaces. (Edwards 1980). Jumping spiders of the Phidippus genus are harmless and thanks to their killer instincts very helpful spiders. Therefore they represent an irreplaceable helper for the human in the war against harmful insects and have an undeniable agricultural importance. Large species like P. regius, produce a relatively strong toxin and are capable of giving a painful bite. However they only take active defense in imminent danger and improper handling. De Voe RD. Ultraviolet and green receptors in principal eyes of jumping spiders. Journal of General Physiology, 1975 Aug, 66(2):193-207. Edwards, GB 1975. Biologické studie Salticidů druhu Phidippus regius CL Koch. MS práce, University of Florida.